Potatoes are packed with starch, Vitamin B6, C and fiber. Its skin has fibre, flavonoids and other nutrients. This is very quick and easy snack, tastes awesome. 8 medium size potatoes (you can use any color potatoes purple ones are the healthiest choice). First cut the potato into two halves (in a oval shape) and scoop out the middle part of the potato to create a cup shape. Keep the potato skin. Arrange them in an oven safe tray and shake a little salt on them along with spraying the oil. Place it in a oven to broil for 10 minutes, or until it turns golden brown. Turn off the oven and allow it to cool. Mix the carrot, onion, cilantro, salt, garam masala powder, coriander powder, and chilli powder thoroughly in a bowl. Next fill this mixture in the potatoes and top it with a ½ a tsp of sour cream, plain yogurt, or greek yogurt. 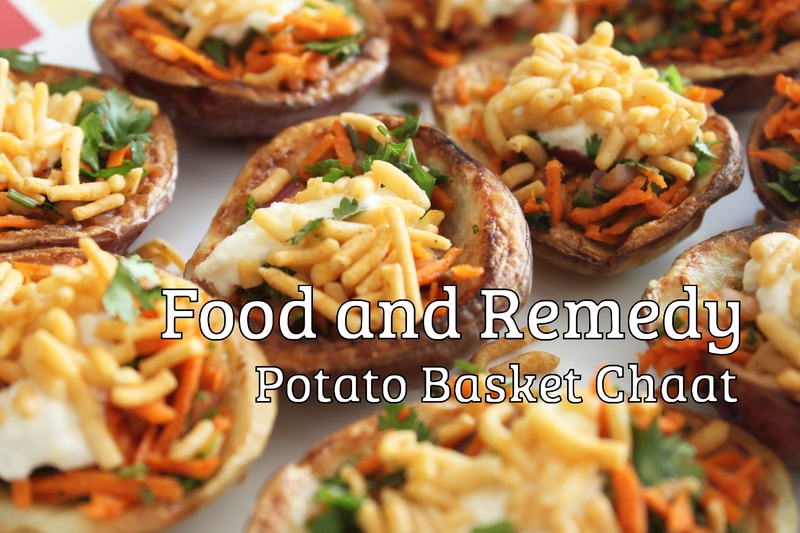 Garnish it with a little crunchy sev and serve them as a snack or appetizer. Your recipes are awesome. Just remind me of amma’s preparations. Being a passionate foodie & a restaurateur i can’t stop admiring your originality.